I recently rebuilt my home server machine to run Windows 7. I attached my ThinkPad USB Keyboard with TrackPoint to the machine (love these keyboards – the feel and usability of a ThinkPad keyboard on a desktop!! ), but after setup, I found that I was having difficulty logging in with the username and password I had specified. I did also notice at one point that I was getting strange characters when I typed, which I quickly realised was the NumLock on the keyboard being activated. Unfortunately, there is no NumLock indicator light on the keyboard (designed to be used with a ThinkPad, which displays NumLock status on the screen), so I couldn’t tell whether it was active or not. A bit of experimentation at login and I found that the NumLock was being enabled by default on my new box – and a search of the BIOS settings didn’t turn up any options there for disabling it. A quick Google search found some discussions about the issue, which identified a registry setting you can set to adjust this. 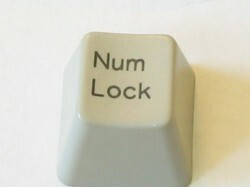 In my case, the registry entry was set to some high value, which seems to have triggered NumLock on. I reset it to 0 and it now works as expected – no NumLock at bootup. Note that this entry can also be set on a per-user basis. Thank you so much, this was really annoying me!